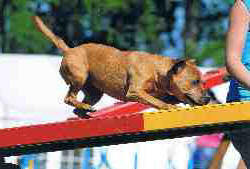 With ever increasing numbers of Staffords competing in agility across the grades, we are able to represent the breed's versatility within canine sports, in the form of an agility league. This is an opportunity for Stafford owners who share a common interest to celebrate their personal achievements with the breed. 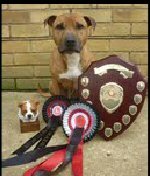 East Anglian Staffordshire Bull Terrier Club has offered to sponsor the League as they feel it is important to recognise the breed's achievements in all disciplines. They will donate a perpetual trophy for the overall winner, a trophy for the overall Top 3 and a rosette for the winner of each grade. The League is open to all purebred Staffords. Well done to all Staffords that took part in the League this year. The results of the KC League and Other Shows League are shown below. 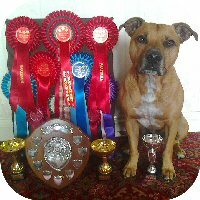 Awards will be presented at Crufts where the East Anglian Staffordshire Bull Terrier Club Agility Team are doing a demo in the Main Arena on Thursday, 6 March 2014 and Friday, 7 March 2014. Anyone who would like to join the League please contact Avril Taylor at avrilj10@sky.com. Membership is free. Congratulations to Taz. Here he is with his cups, shield and rosettes after winning the Graduate Agility and Jumping at BAA as well as winning Medium Graduate of the year. Congratulations to the members of the East Anglian Staffordshire Bull Terrier Club Agility Team who carried out a wonderful demonstration in the main arena at Crufts on Thursday, 7 March. The whole team did the Staffordshire Bull Terrier breed proud. This display showed the public a different side to the breed and really promoted what they are capable of. 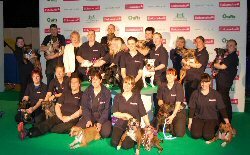 The awards presentation for the Staffordshire Bull Terrier Agility League 2012 took place at Crufts on Thursday, 7 March. The 2012 overall KC winner was Avril Taylor with Dakota (Javawolf Ever Reddy). In 2nd place was Christine Weir with Rebel (Georgeous Lord George) and 3rd was Christine Weir again with Roxy (Roxy Rebellious) . We would like to say a big thank you to The Ramblix Collection for supplying fabulous trophies for the top three Staffords in the KC League and to the East Anglian Staffordshire Bull Terrier Club members who sponsored the rosettes. Good luck to everyone in 2013. Congratulations to Anne and Taz - what a time you have had at the BAA championships. Taz is certainly a role model for the Staffordshire Bull Terriers breed. What a clever boy and I cannot wait to see the video of you two dancing together in the talent contest. Out of 24 runs Taz got 22 clears and only two poles down in the whole show. We are so proud of both of you and Taz is certainly a credit to the Staffordshire Bull Terrier. I am sure not many competitors have managed to get that number places at a show! 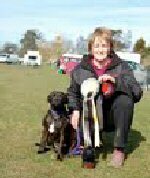 Congratulations to Liz and Lola for winning out of Grade 3 to Grade 4 at the Barking Mad Open show on Saturday. My magical powers worked just as I said! Lol. Just look at the smile on Taz's face. Well done with lots of love Anne and Taz. Huge congratulations to Avril James and her wonderful Staffordshire Bull Terrier Dakota for winning into Grade 7! Well done from Anne and Taz and Liz and Lola (members of the Staffordshire Bull Terrier League). Well done to everyone who took part in the first SBT Agility League last year. It was a great success and wonderful to see some many Staffords competing and doing well.